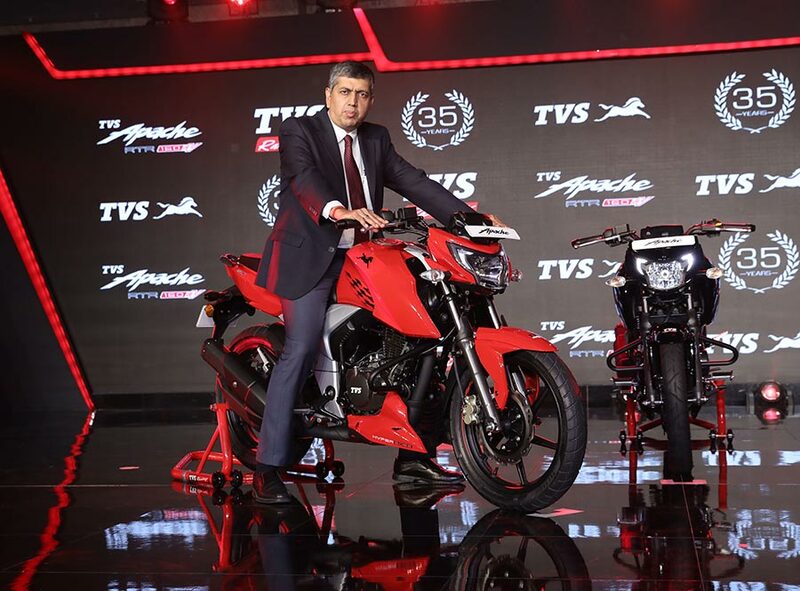 TVS Motor Company, a leading manufacturer of two-wheelers and three-wheelers in India, today launched the new 2018 TVS Apache RTR 160 4V. A testimony to the racing legacy of the TVS Apache RTR series, the new TVS Apache RTR 160 4V is the most powerful 160cc motorcycle, creating a new benchmark in the segment. The new TVS Apache RTR 160 4V is born of the six-time Indian National Motorcycle Racing Championship (INMRC) winning motorcycle – (Group B RTR 165) and gets the 4-valve, oil-cooled engine that offers best-in-class performance. The TVS Apache series has always embodied pure racing performance. This Racing DNA is seen across the entire range from RTR 160 to the RR 310. With the launch of the all new TVS Apache RTR 160 4V, we have created an exciting product that will appeal to customers around the world. In over 10 years of its existence, the TVS Apache RTR series has created phenomenal customer delight. 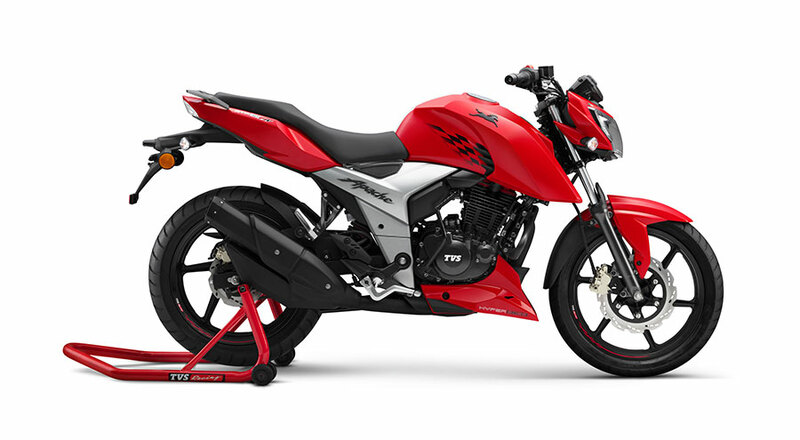 The new TVS Apache RTR 160 4V is an exciting addition to the TVS Apache RTR series. It is the most powerful 160cc motorcycle in India and embodies the latest racing technology with best-in-class performance. We are confident that the new TVS Apache RTR 160 4V will set the precedence with its superior performance and dynamic racing look. Staying true to its racing pedigree, the TVS Apache RTR 160 4V has the most powerful 160cc engine, enabling the best performance in its class and boasts of a top speed of 114 kmph (EFI), 113 kmph (Carb). Complete with best-in-class power-to-weight ratio, the motorcycle does an astounding 0-60 kmph in 4.8 seconds(EFI) and 4.73 seconds (Carb). TVS Apache RTR 160 4V comes with the TVS Motor Company patented Double-cradle Split Synchro Stiff Frame Design, which gives excellent high-speed stability and best-in-class handling on/off- track. The mono-shock suspension, engineered and precision-tuned by inputs from TVS Racing riders, contributes to the razor-sharp handling and agility through the corners. Placing paramount importance on safety, the TVS Apache RTR 160 Fi 4V comes with both rear and front disc brakes while the Carburetor motorcycle is available in Disc and Drum variants. With a fully-digital speedometer, the design of the new TVS Apache RTR 160 4V offers sleek styling along with the race-spec aspects of the INMRC race machine – RTR 165. The forward biased stance with tight proportions is complemented by the aggressive headlamp, chiseled body and a sleek, sharp tail. The motorcycle boasts of a compact race design with chequered flag decals on the tank, a fitting homage to its winning streak on the race track. The TVS Apache RTR 160 4V series is available in three stunning colours, namely, Racing Red, Metallic Blue and Knight Black.